Rob Prior unveils another masterpiece featuring the one and only Tech N9ne in this glorious, limited edition print. 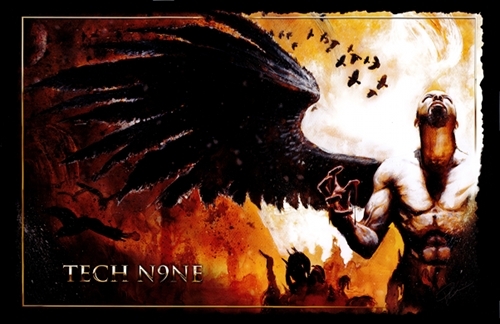 Continuing their exclusive collaboration, Tech N9ne and renowned artist, director and writer, Rob Prior, created a brand new limited edition poster print that you can only get right here from Strange Music. Available in 2 sizes: The 24″x15.5″, of which only 300 were made, is the most recent interpretation of Tech N9ne. The 24″x36″ is the exact same image of Tech N9ne, but the most limited version – only 250 were made and then Tech and Rob hand numbered and signed all 250! ***One lucky fan who purchases a signed and numbered 24″x36″ poster will have an exclusive, one of a kind, original sketch on the back of their poster, drawn by Rob Prior during his signing! -> The numbered and autographed 24″x36″ and get yours ordered before they’re gone! – What do you think of the When Demons Come print?